It's April Fools' Day y'all, and we thought we should mark the occasion. And since we're far too busy and important to spend the morning secreting whoopee cushions on all your chairs, we've opted instead to celebrate the Shakespearean fashion of fooling. But how did it all begin? There are two kinds of fool that began to establish themselves as court jesters during the medieval and Renaissance periods: the natural fool, who is physically or mentally challenged; and the artificial fool, who behaves in a deliberately foolish manner. Many European monarchs retained fools in their households, including Elizabeth I. Her favourite was Richard Tarlton, who was the first court clown to achieve national recognition; he toured his act around the country and was celebrated for his comic abilities. 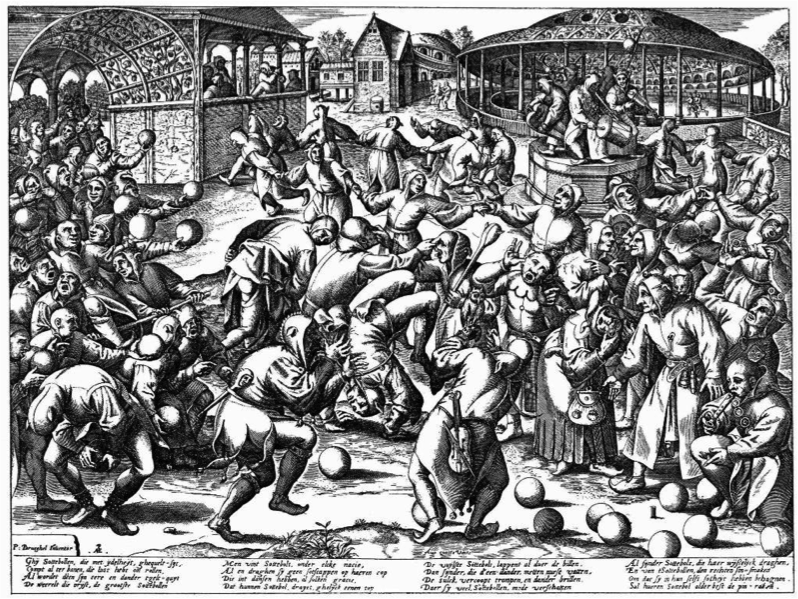 He had an extraordinarily positive effect on the popularity of the fool, which had previously been condemned by the church with many moral plays depicting fools as weak and sinful. Tarlton was instrumental in shifting this perception and became the forerunner of the Shakespearean stage fool we recognise today. Perhaps the best way to explore Shakespeare's fools is to take a closer look at the men who played them. William Kemp was a musician and dancer, well-known for his jigging ability. He began his comedic career working in the service the Earl of Leicester, before joining Lord Strange's Men in 1592 as a stage fool. It was during this time that he began working with William Shakespeare and James and Richard Burbage, and from 1594 to 1599 Kemp was Shakespeare's primary clown. The roles played by Kemp were buffoons: poorly educated and finding humour in their status as objects of ridicule; never able to articulate their thoughts effectively, struggling to find the right words. It is generally agreed that the roles of Bottom in A Midsummer Night's Dream, Dogberry in Much Ado About Nothing and Lancelot Gobbo in The Merchant of Venice were written for him. 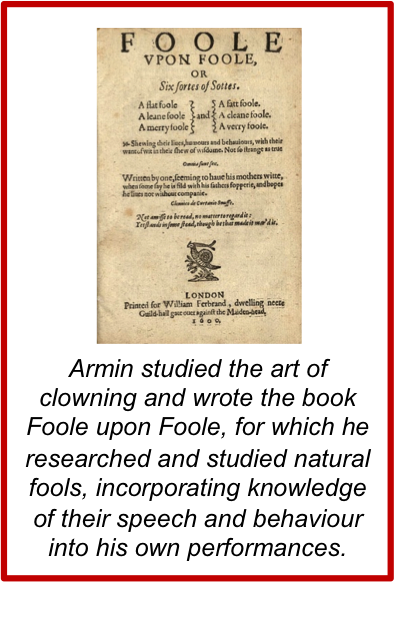 The fools portrayed by Robert Armin were cut from a different cloth. Presented with a new set of talents in his new clown, Shakespeare began to craft a new kind of fool; while the bumbling clowns played by William Kemp entertained audiences with their inability to grasp the English language, Armin's fools are skilled at wordplay and frequently best members of high society in battles of wits. In being deemed lowly and foolish by every other character in the play, Shakespeare was able to use this new construct of the wise fool to question society's constructs and speak unwelcome truths. Feste in Twelfth Night or Touchstone in As You Like It are free to speak as they find, and are the perfect vehicles for satire: the humour of these plays lies in the fool highlighting the ridiculous behaviour of others and subverting the expectations of hierarchy. For honesty coupled to beauty is to have honey a sauce to sugar. So on this April Fools' Day, do it Shakespeare's way. Go forth and seek out some uncomfortable truths, or if you're feeling especially brave, dispense some. Inspire great moments of self-reflection and change. Be Feste cajoling Olivia into throwing off her shroud of grief; or Lear's fool, opening the king's eyes to his own self-involvement. Learn to play the lute and do it to music. All's well that ends well... right?